Besides our great targeting options such as location, platform, and OS, we also offer advanced targeting options to really help you hone in on the best audience for your campaigns. Interest targeting uses the Outbrain Interest Graph that we create for any user who engages with our content. Attribute targeting uses data from our vendor partners to help add an extra level of granularity. 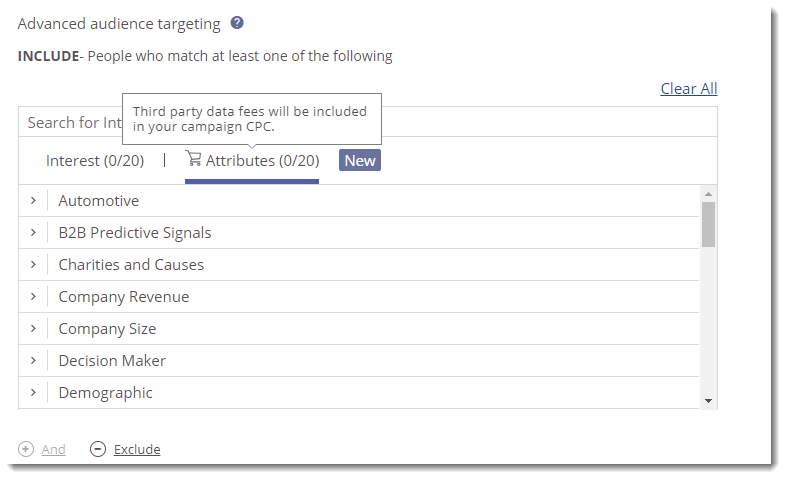 While there is no charge to use Interest targeting, using attribute targeting does incur a third party data fee that is charged in addition to your CPC. Both of these options are located in the Advanced Audience Targeting section within our Targeting settings. 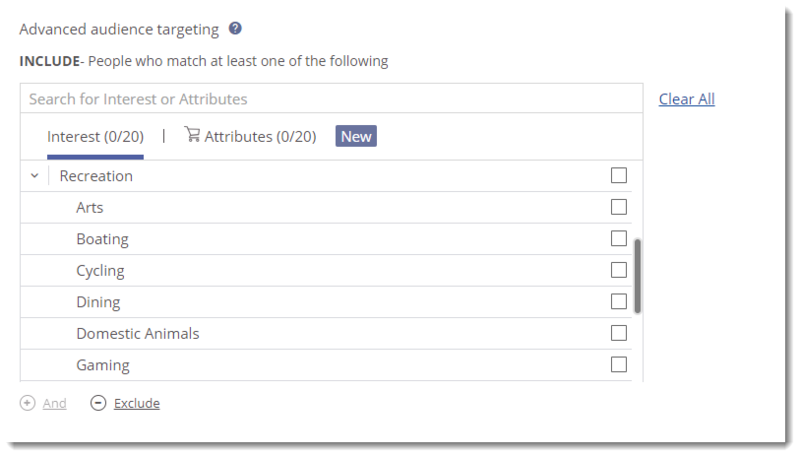 This feature allows you to select your target audience segment based on the topics that they’re most interested in; giving you a higher level of granularity when choosing where your campaign should appear. 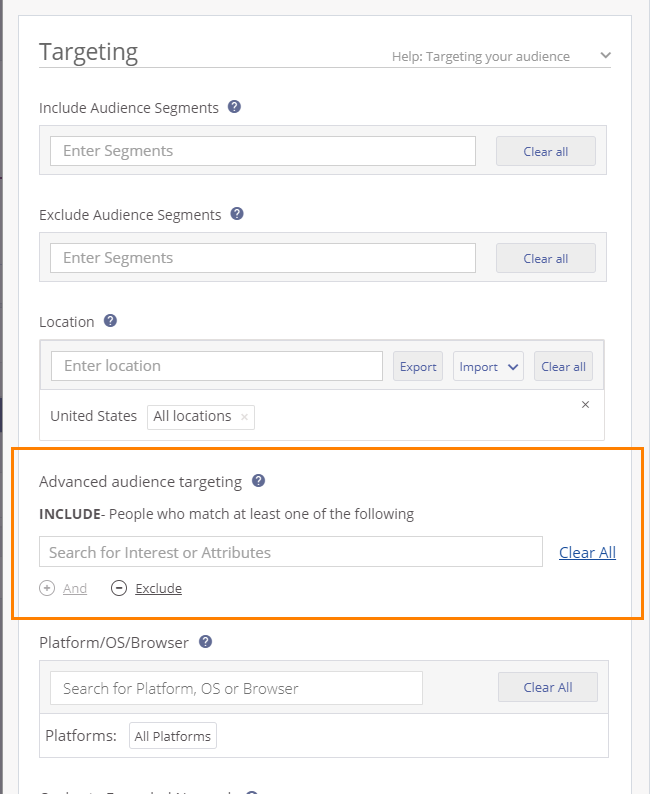 To add Interest targeting, first locate the Advanced audience targeting section. Click the Search for Interest or Attributes box and select Interest. From the list of interests, you can select an entire category. You can also select a subcategory within that category, or any combination of subcategories and categories that you’d like. When selecting multiple categories or subcategories, each one will be treated as a separate group. For example, if you select “football” and “cooking” you will reach people who are interested in either football OR cooking. However, if you select the “AND” option and pick an interest, you will only reach people who are interested in both football and cooking. Please keep in mind that the more “AND” interests you add, the smaller your scale will be, because the audience is becoming more and more niche. You can also exclude interests if you wish, although keep in mind that doing so runs the risk of significantly reducing your campaign reach. With each interest selection, make sure to check the Reach Estimator on the right side of the menu. This gauge will tell you how large or small your reach is and can help you decide whether to expand or narrow your target range. If your campaign isn’t spending enough, it’s likely due to narrow reach; in this case, try removing some audience targeting to open your campaign up to a larger audience. Once you’ve reviewed your audience targeting options, click the “Save” button at the bottom of the menu. Through partnerships with vendors like Bombara, Acxiom and Connexity, Outbrain offers hundreds of demographic, intent, and professional targeting segments or attributes you can add to your campaigns. Please note that using any of these segments will incur an additional third party charge that will be automatically calculated with your total CPC. To add a demographic segment, locate the Advanced audience targeting section. Click the Search for Interest or Attributes box and select Attributes. Like with Interest targeting, you’ll see categories and subcategories. Unlike Interest targeting, you are not able to select entire categories. Instead you are only able to add subcategories. Each subcategory will have a prompt telling you how many users are in that segment, the cost of that segment, a description, and what vendor the segment is coming from. When selecting multiple subcategories, each one will be treated as a separate group and follow OR logic. For example, if you select the segments “Ages 35 – 44” and “Dwelling Type Single-Family” your campaign will target audiences who are in between the age of 35 and 44 OR people who live in a Single-Family home. However, if you select the AND option and pick a segment, you will only target people who are in those age ranges AND who also live in a Single Family home. Please keep in mind that using “AND” segments will reduce your campaign’s potential reach, because the audience is becoming more and more niche. 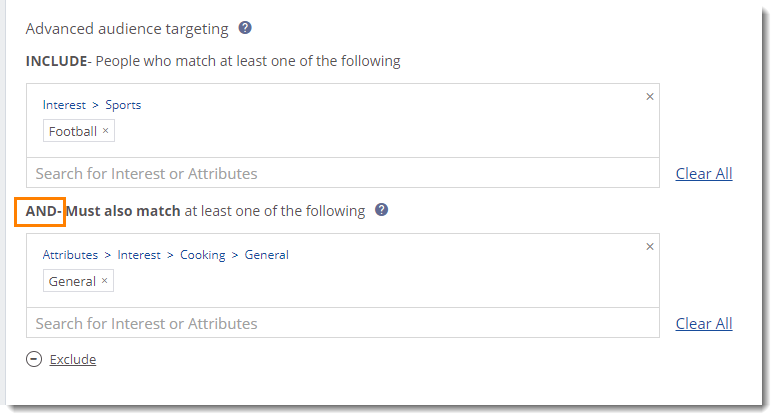 Like with Interest targeting, you can also add segments to be excluded from your campaign. Each attribute targeting segment has a cost that will be added to the campaign’s CPC. How it works is that if a click comes from a user that is in the targeted segment, the click will be charged the cost of that segment in addition to the CPC. These 3rd Party fees will come out of the campaign’s budget. This means that if you use these segments, you may see less clicks as some of your budget will be allocated to the fees. What if you use multiple segments? How do we determine how much will be charged? When you receive a click, our system will check to see if it came from an audience in one of the attribute segments you’re targeting. Even if the click came from multiple segments, you’ll only be charged once. The exception to this is if you are using a segment in the ‘AND’ section from multiple vendors, which means that you’re looking for audiences that are included in both segments. In this case you may charged for two segments. One charge for the segment in the INCLUDE section and another for the segment in the AND section. Our system will automatically calculate these charges for you based on the segments you choose. 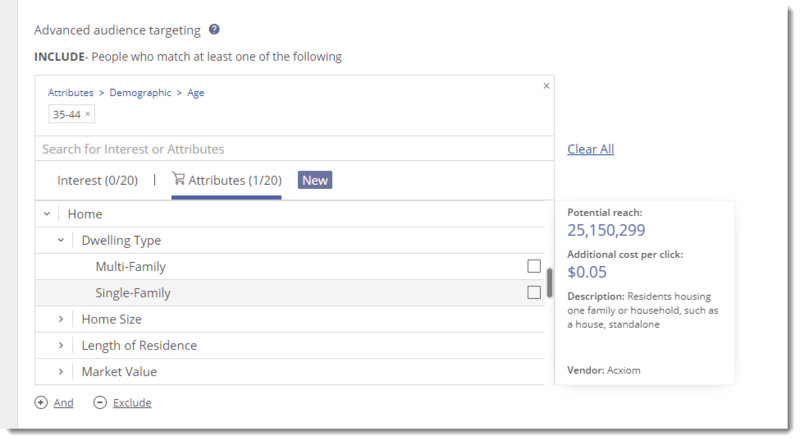 If you use attribute targeting segments, at the end of the month your invoice will have a new line item called Vendor Data Costs which will be the sum of all the 3rd party data charges your campaigns incurred. When using any targeting options, always keep an eye on the Potential Reach estimator to ensure that your campaign reaches enough audiences. Because Interest and attribute targeting allow for more specialized audiences, we recommend increasing your CPC to accommodate for the limited reach. You can include up to 20 interest segments and 20 attribute segments per campaign.